I had my 100th sale on Monday. Actually I had my 99th, 100th, 101st, and 102nd sale on Monday. It was my best sales day ever. I opened my shop, It’s Still Life, just over 11 months ago on Etsy. When I first opened it, I set a goal of 50 sales in a year. But sales were going well, so I change that a month into my adventure to 100 sales in one year. I would enjoy spending more time on my business, but it is not my top priority, my family is. I am fortunate enough to have a spouse who, with careful spending, provides for our family with his career. My sales help provide for my hobbies and passions. I love selling on Etsy. It really is a community feel. I have had conversations with amazing people. Only once did I have a bad experience. That is a pretty great average, don’t you think? So what was my 100th sale, you ask? Something I listed back in December. 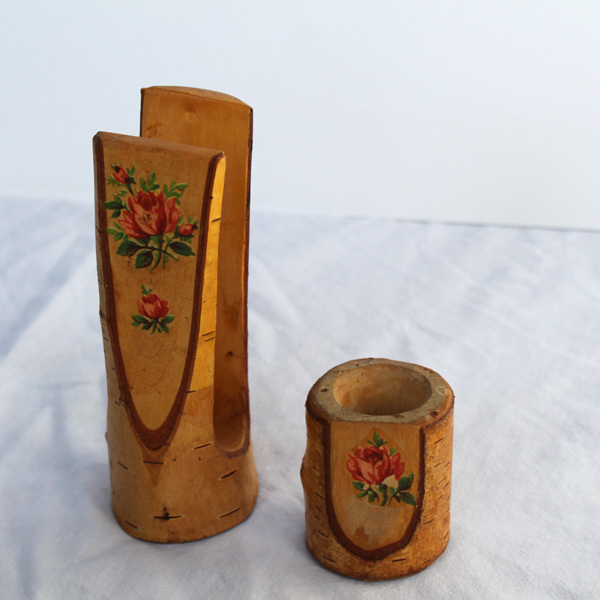 Something fun and funky…a set of napkin and toothpick holders carved out of wood. I feel like there should have been a drum roll or something. The best part was the buyer, Heather, wrote a little note when she purchased it. “So simple…I love it. It is going to a good home. :o)”. Some how I am sure it is going to a great home. 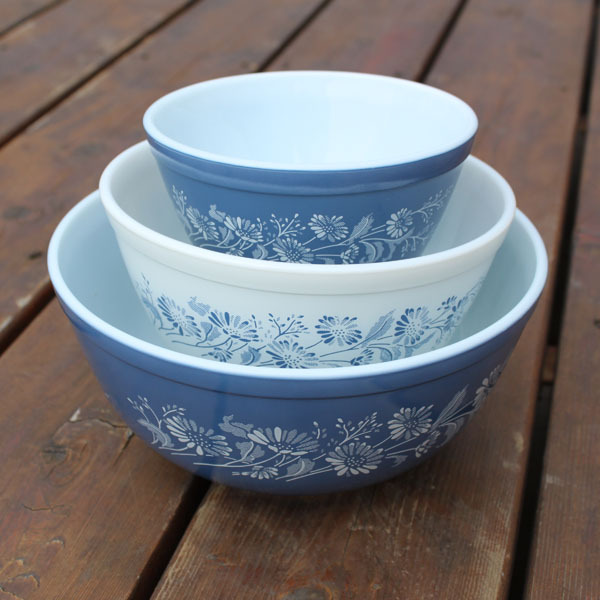 Just in case you are wondering, my 101st sale was this set of Colonial Mist Pyrex Nesting Bowls. I just recently listed it and hadn’t had time to show you on my blog yet. 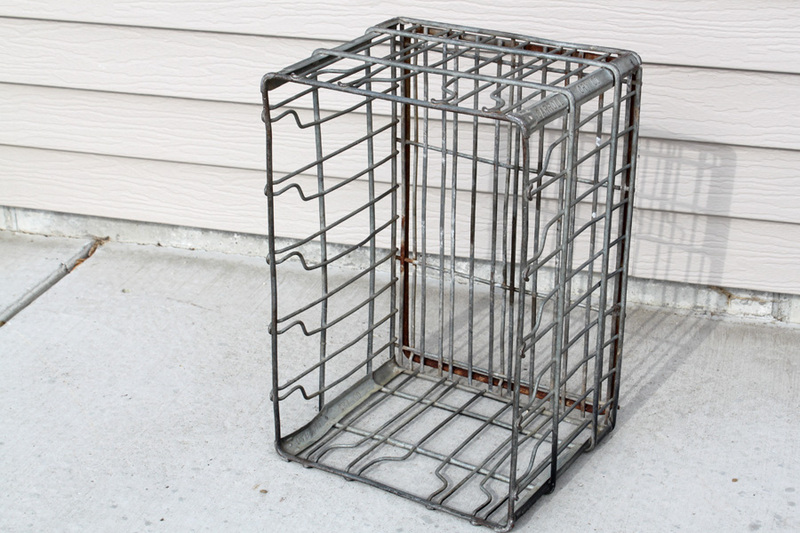 My 102nd sale was this wire dairy crate that I listed last fall. Sometimes it takes a while to get a sale. I am learning patience. Well, not really…I should be learning patience. I am just a slow learner. Here is hoping I hit 115 sales by my one year anniversary. I will let you know. Wow! Congratulations on reaching your goal! You are inspiring me to get my Etsy shop opened! We are busy moving me into my new studio and I’ve got books to list and then crates of wonderful things to get listed on eBay and Etsy…so exciting! Fantastic job YOU are doing, you deserve to be proud! Good luck moving into your new studio, I think it looks awesome, so cool that you could move a studio on to your property. Etsy is a great place to sell, I say go for it. Thanks, Lynae, I am really enjoying it. Congratulations on reaching your goal! Your are inspiring me to get my Etsy shop opened… and thanks for dropping by my blog! congrats mom! you should give me the credit being i do all the work!!! Just kidding. congrats and enjoy it. Ha, thanks for commenting and thanks for your help in going to garage sales. Wait, you don’t go, do you? But you do help with shipping. Thanks. you are very funny you know. Congratulations on so many etsy sales. That’s wonderful. Thanks Mary Alice. I love finding new blogs. Congrats congrats congrats! It’s so exciting to hit those Etsy milestones, isn’t it? Part of the fun of selling. Here’s to many more sales! Heather, Thanks so much. You rock in your store. You started your store about the same time I did and you have 2.5 times as many sales. You do rock.